Making the shift from a crib to a bed is a big transition for any toddler and her parents. Once deciding your toddler is ready for this change, there are a few different mattress options to consider. There is no one mattress firmness that is best for a toddler. Each available option varies in firmness but is still a safe and comfortable option for your child. What you choose may depend on your child’s attitude towards change, available space and expense. There are generally two types of crib mattresses, foam and innerspring, each of which are suitable for both infants and toddlers, says Consumer Reports. Both are very firm, which is important as it prevents infants from sinking into them. Many parents choose to simply use their crib mattress on a toddler bed until their child is 2 to 3 years old and ready to move into a larger bed, as toddlers still find this firmness to be comfortable. A toddler bed looks like a regular bed except it is lower to the ground and comes with side rails. Most crib mattresses fit toddler beds. Some cribs come with the option of purchasing a convertible mattress. These mattresses are extra firm for infants on one side, and softer on the other. According to Consumer Reports, the softer side for toddlers is made of standard foam or springy, viscoelastic memory foam. Convertible mattresses can be used either with a crib that converts into a toddler bed, or with a regular toddler bed. They are generally more expensive than regular crib mattresses. Some parents choose to simply buy their child a twin bed that he can grow into, putting rails on the side if necessary. When purchasing a regular mattress, look for a softer mattress with innersprings. 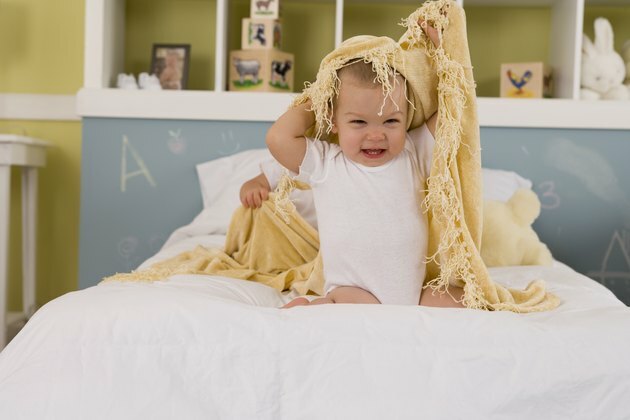 Softer mattresses will conform to a toddler's body, which is much lighter than an adult's. Is a Toddler Bed or Twin Bed Better for a 2-Year-Old?